I’ll admit it. I avoided Everybody’s in Show-Biz for years for the simple reason that I thought the cover looked real cheesy. The cartoon illustration surrounding a colorized pic of Ray Davies crooning just looked so un-rock ‘n’ roll that I figured the songs on it must also be that way. 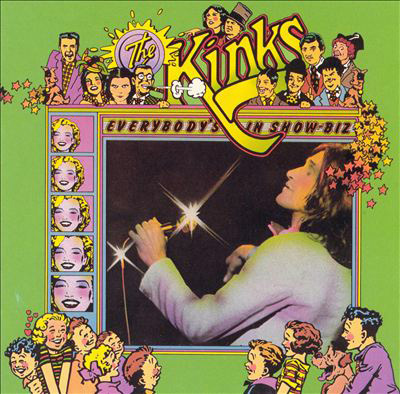 Now, I’ve been a fan of The Kinks for quite awhile so it was only a matter of time before I gave the album a chance. 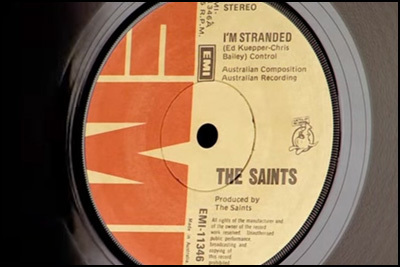 That chance has come now, with the release of a Legacy Edition of this 1972 double album. 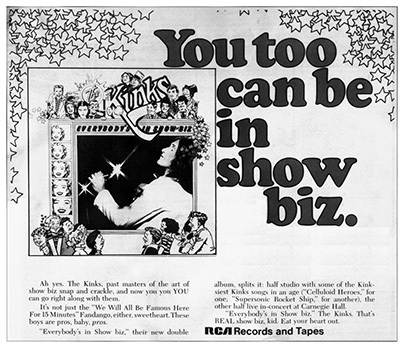 The original issue of Show-Biz was a 2LP affair with one record devoted to new studio tracks and the other to recent live recordings. My guess is that the record label (RCA here in the States) felt the need to bolster the new tunes with live renditions of songs already familiar to Kinks fans, as the band’s following in the US wasn’t at an all-time high. On the live record you got the addition of songs performed at New York’s Carnegie Hall in March ’72, including tunes from Muswell Hillbillies (their previous release) as well as “Lola,” which was their biggest/most recent hit. 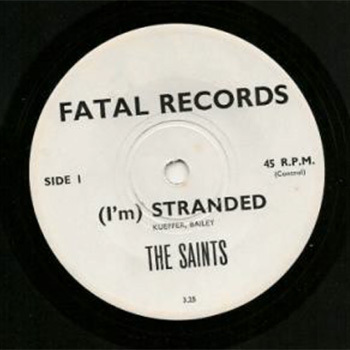 Well, if that was the idea – to add familiarity to help sell the product – it wasn’t enough to katapult the record into the upper reaches of the charts. They should’ve added more familiar live cuts to achieve that end. That, by the way, has been sorted out on this new edition, which features a further 13 live tracks including “Sunny Afternoon” and “’Till the End of the Day.” Yet, even without these great live tracks, Everybody’s in Show-Biz is a stone-cold Kinks klassic. Ray Davies’ new tunes on Show-Biz are all of his top-shelf variety, even if you take away “Celluloid Heroes,” which is acknowledged by most to be one of the man’s best tunes. It comes last on the studio record, so you gotta listen to the other nine songs first. No problem. Drop the needle (oh, I mean, pop in the disc and hit play) on “Here Comes Yet Another Day” and enjoy the ride through “Hot Potatoes,” “Sitting in My Hotel,” and brother Dave’s “You Don’ Know My Name” and you’ll understand why I say this is as good as The Kinks Are the Village Green Preservation Society, Something Else or Arthur. Man! I love this record. The band is indeed making a transition from the garage/hard rockin’ ’60s version to a more mature one, but that doesn’t mean the songs suffer – at all. What you get here is an almost middle-aged Ray Davies sorting out the current condition of his life and career, out loud in front of you, me and everyone, with stupendous results. Kolor me embarrassed that it took a value-priced deluxe edition for me to embrace Everybody’s in Show-Biz. For less than twenty bucks you, too, can be in show biz. Just like the ad there says. Here’s a live rendition of “Celluloid Heroes” from 1979 with some superb lead guitar from Dave Davies. It’s amazing that Paul McCartney hadn’t gotten around to a compilation of his solo/Wings material of this magnitude until now. 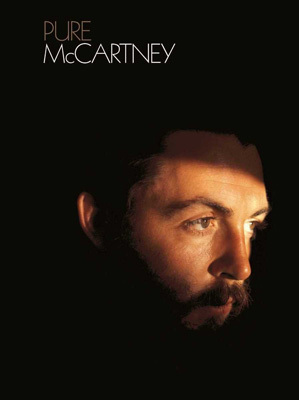 Pure McCartney follows in the footsteps of his previous best-ofs in that it completely overlooks chapters of his output as if he’s embarrassed by them… Or warning the marketplace that a certain album is about to be given the Archive Series treatment and thus including none of its tracks. Could he be that canny? That crass? I hate to say it: Yes. As is the custom these days, this compilation comes in multiple form factors: you have the budget 2CD version, the 4LP version and the mega 4CD version. 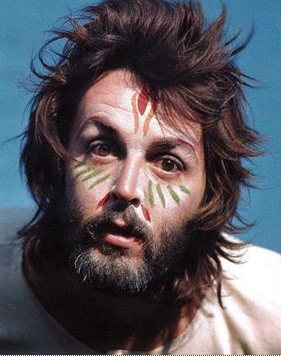 With 67 tracks on this behemoth, you’d think Macca could cover all of the ground he’s trodden since his first solo album in 1970 and yet he completely avoids Driving Rain (not the greatest album), Run Devil Run (a ’90s album of covers) and 1989’s brilliant Flowers in the Dirt. I’d expect a 4CD collection of a 45 year solo career to favor some albums more than others – Band on the Run and Ram are heavily represented – but I’d also figure at least one song from each album would be manageable. And since Flowers is such a classic, you’d think a big hit like “My Brave Face” would make the cut. Nope. (Don’t get me started on the fact that there’s only two songs from Venus and Mars here.) There’s no reason to not represent Flowers except that he’s trying to avoid cannibalising an Archive Series release later in the year. And that smacks of pure commercialism. Take a look at the tracklist of the various versions to decide whether you need this release. For me, I have everything on the 4CD version so I expect to be skipping over this one, at least for now. And that, my friends, is Pure Gooch. 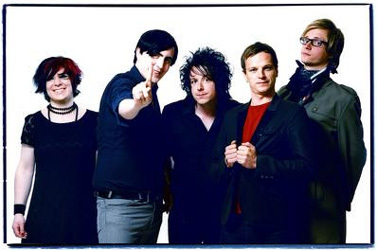 What stood out about Art Brut, then and now, is Argos’ humorous lyrics matched with the band’s indie-punk delivery. Instead of a frontman telling us (like umpteen lead singers before him) of his virility and of all his female conquests, we got a guy lamenting his inability to perform (and I don’t mean on stage) with the girl of his dreams. At the same time, this anti-Romeo was going to – along with his bandmates – write the one song that would “make Israel and Palestine get along.” Well, that didn’t happen, but they did gain a healthy following for awhile. 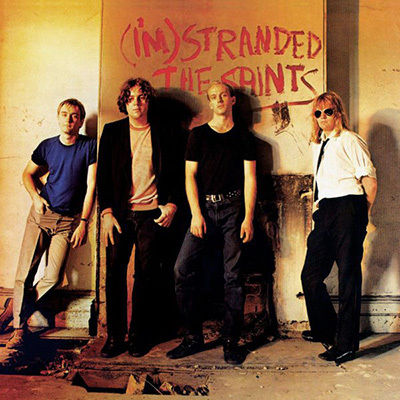 I got to see them a few times back then and they were as exciting and fun on stage as their records promised. Sadly, their first album was their best and Art Brut seemed to lose more steam with each new release. Their last outing, the 2013 2CD compilation Art Brut Top of the Pops, put together a disc of “best of” material with a disc of rarities and B-sides. Though the band appears to still be together (their website indicates new tunes are in the works), it seems unlikely that they’ll manage to cadge the energy and vitality of their hilarious ’n’ catchy debut. Still, I’d be willing to have a listen. Their refreshing, self-deprecating approach is one that’s in short supply these days. I mean, as far as I can tell, none of the band listen to the Velvet Underground, don hipster beards or do any variety of ho-hum, generic activities that would indicate they have motives other than just to create catchy punk rock. 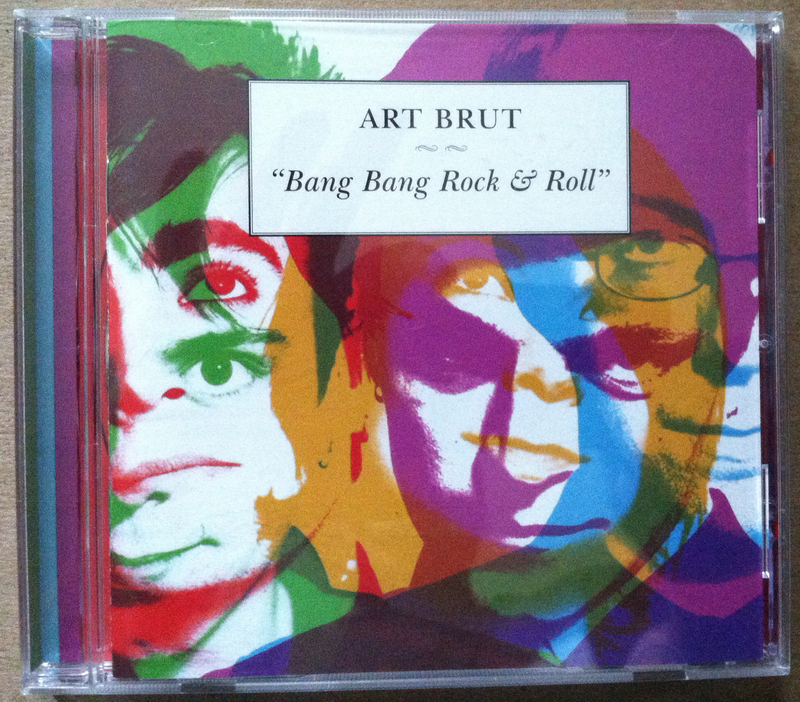 You can do it, Art Brut! Give us another Bang Bang Rock & Roll!